After missing the first month of the season with an oblique injury, Jorge Soler is finally ready to begin his tenure with the Kansas City Royals. On Saturday, the Royals activated Soler from the DL, allowing him to make his season debut later in the day against the Indians. 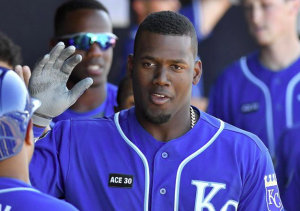 Soler figures to become a part of Kansas City’s every-day lineup, as the Royals are hoping he’ll be able to emerge as the team’s primary right fielder this season and for years to come. The Royals acquired Soler over the winter in a trade involving former closer Wade Davis. Soler had an up and down 2016 season, missing a month with a hamstring injury and failing to make much of an impact for the Cubs in the postseason. However, with Soler being under team control through 2020 at a reasonable price and possessing tons of raw power, the Royals see great upside in the 25-year old Cuban. Heading into spring training, Soler figured to be a big part of Kansas City’s outfield, which appeared to have considerable depth. The Royals even traded Jarrod Dyson to the Mariners to create more space for Soler and Paulo Orlando. However, those plans changed drastically when Soler suffered an oblique injury late in spring training. Orlando began the season as the team’s primary right fielder, but after hitting .149 through the first couple weeks of the season, he was optioned to the minors in favor of rookie Jorge Bonifacio. Bonifacio has done well for himself early in his big league career, hitting .262 with a .731 OPS. However, the Royals are likely to give most of the playing time in right field to Soler, who has a little more power and more upside than Bonifacio. In just 86 games with the Cubs last year, Soler hit a career-high 12 home runs, power that the Royals could use right about now. The Royals are last in baseball in runs scored by a large margin. They are also last in baseball in batting average and slugging percentage, as much of Kansas City’s lineup has performed poorly over the first month of the season. The addition of Soler to the lineup is unlikely to turn everything around for the Royals, but it could act as a spark to help get players like Alex Gordon, Brandon Moss, and Alcides Escobar going offensively. All three are currently hitting under .200 on the season. Before being activated on Saturday, Soler played in 11 minor league rehab games at triple-A, hitting .308 with three home runs, so there’s some hope he can hit the ground running upon his return. If Soler can start producing, the Royals may look to move him to the DH spot, keeping right field available for Bonifacio. Moss has been the primary DH early in the season, but he’s hitting just .159 this year, and the Royals can’t afford to wait much longer for him to turn things around. The Royals are currently 10-18 and the only team in the AL Central now within half a game of each other heading into Saturday. With several key players approaching free agency, Kansas City’s window to compete may be closing. It’s imperative that the Royals get things turned around as soon as possible, and the team hopes the return of Soler from the DL can be the spark necessary to start moving in the right direction.